Execu/Tech Systems, Inc. software DOES NOT STORE CREDIT CARD NUMBERS. We only store a token that's returned by Shift4. This is not a credit card number and does not contain the credit card number. Execu/Tech Systems, Inc. does not have access to the credit card numbers of your guests and can't provide to you. If you need to see a credit card number, you must contact Shift4 for assistance. It's important to understand the flow of data between Execu/Tech Systems software and Shift4. This understanding can help you determine if you are PCI compliant and can allow you to provide accurate information during a PCI audit. Cardholder data is captured, either by a card reader or manual entry, in a secure web page and posted via HTTPS to Shift4's i4Go service. The Shift4 i4Go service returns to us a token consisting of a randomly generated alphanumeric string. The token is saved by Execu/Tech Systems software. "The actual CHD is sent to one of Shift4's PCI-compliant data centers for storage while the TrueToken, and only the TrueToken, is used to process the transaction. Since the TrueToken only references the real data associated with the specific transaction, it can safely be stored and used for later authorization, settlement, and recurring charges." Execu/Tech Systems software submits the payment transaction to Shift4's UTG application, residing on the property's network, using this token. Shift4's UTG application will submit this transaction to Shift4's secure servers. 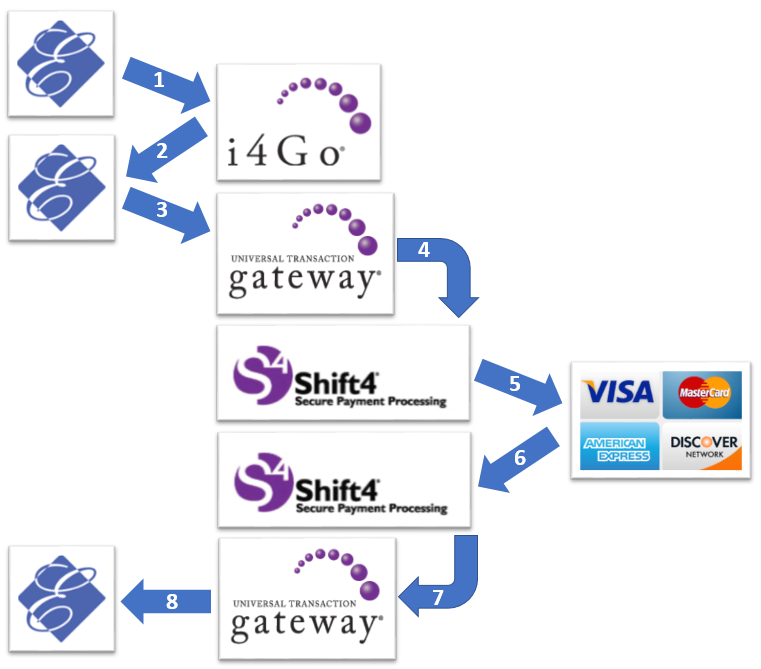 Shift4's secure servers will submit this transaction to the back end processor. The back end processorr will return the result of this transaction to Shift4's secure servers. Shift4's secure servers will return the result of this transaction to Shift4's UTG application. Shift4's UTG will return the result of this transaction and Execu/Tech Systems software will deal with it accordingly, whether it be a success, card declined, needs voice authorization, etc.